Rosemary is an aromatic, evergreen perennial herb that is part of the mint family. It has needle-like leaves and is also known as Rosmarinus Officinalis and Anthos. It is native to the Mediterranean region and has been used in cooking, soaps, fragrances, cosmetics, and herbal remedies for centuries. It is also known as a symbol of love and traditionally its sprigs are used in wedding ceremonies. Studies have found that it is rich in a number of components such as calcium, potassium, magnesium, iron, vitamin C, vitamin B6, vitamin B12, thiamin, niacin, riboflavin, protein and dietary fiber which may explain its long history of medicinal use. It also contains carnosic acid which is known to promote cognitive performance and eye health. Rosemary has been used in the treatment of many health conditions for centuries. Studies suggest that Rosemary may have anti-inflammatory, antibacterial, antimicrobial, antiseptic, anticarcinogenic, and antioxidant activity. Therefore, it may help with digestive tract problems, headaches, respiratory conditions, bad breath, body odor, baldness, Oedema (fluid retention), neurological and cognitive problems, macular degeneration, poor blood circulation, and arthritis. A few preliminary results suggest that it may also relieve muscle pain, increase menstrual flow, promote urine flow, prevent thrombosis or blood clots, and improve hair growth. Studies show that the antibacterial and anti-inflammatory properties of rosemary may help with indigestion and gastrointestinal infections. In fact, in Germany, rosemary has been approved as a safe and effective herb for treating dyspepsia (impaired digestion). Therefore, drinking Rosemary tea three times daily at the onset of indigestion, mild food poisoning, diarrhea, and vomiting may help soothe your digestive tract and relax the stomach. To make Rosemary tea, simply boil one to two stems of Rosemary in a cup of water for 5 minutes, strain the stems and add sugar or honey for taste. Aromatherapy with rosemary is an effective remedy for migraine headaches. Studies have found that the soothing and stimulating properties of Rosemary may help relieve stress related headaches by promoting blood circulation in the brain and by lowering levels of the stress hormone cortisol. An effective home remedy for headaches and migraines is to inhale the vapours of rosemary. Simply boil five or six fresh Rosemary stems or add five to six drops of the essential oil into a medium size pot of water. Once the water comes to a boil, place a towel over your head and inhale the steam from the boiling pot by breathing deeply and slowly for about 10 minutes. As mentioned earlier, Rosemary may help lower cortisol - the stress hormone. Studies show that using rosemary may help increase concentration and help with symptoms of anxiety and stress. Therefore, drinking one cup of Rosemary tea daily may help keep you calm and relaxed. In one study, aromatherapy using Rosemary and Lavender essential oil sachets showed significantly reduced stress levels in students before an exam. To make Rosemary sachets, simply put a few drops of the essential oil on 4-5 small cotton balls and tie them in a small 6 inch by 6 inch piece of thin cotton or burlap fabric or put the cotton balls in a small ready-made fabric sachet. Simply keeping the sachet beside you while working or sleeping may help reduce stress and anxiety. Research suggests that Rosemary contains an ingredient, carnosic acid, that has antioxidant and neuroprotective properties which may control free radical damage in the brain. Rosemary also improves blood circulation, and better blood circulation in the brain promotes the overall health of the brain. Therefore, drinking one cup of tea made with 3-4 stems of Rosemary or taking one capsule of Rosemary extract with carnosic acid (CA) daily may help protect against Alzheimer's disease and memory loss and improve cognitive performance. A study done on rats at the National Institute of Health, Maryland, found that long term use of Rosemary extract (which is rich in carnosic acid) may moderate weight gain and improve the plasma lipids profile. The study also noticed a significant reduction in serum triglycerides and cholesterol levels. 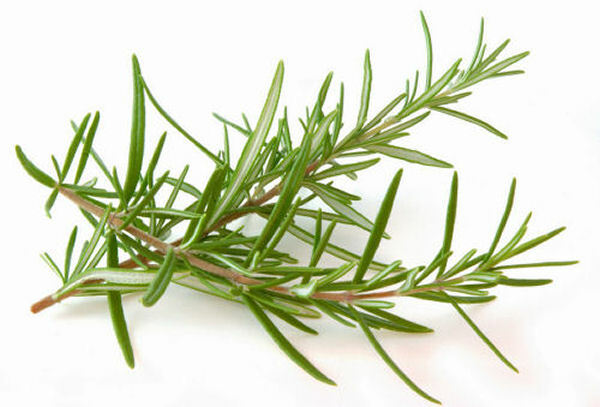 Therefore, drinking 1-3 cups of Rosemary tea or taking one capsule of Rosemary extract daily may promote weight loss. Due to the aromatic, antibacterial and antiseptic properties of Rosemary, it can effectively be used as a mouthwash for bad breath caused by gingivitis or oral bacteria. To make Rosemary mouthwash, simply boil 5 to 6 stems of fresh Rosemary in a litre of water for 10-15 minutes. Let it cool and then strain the water into an airtight bottle. This organic Rosemary mouthwash can be refrigerated for up to a week. Using Rosemary mouthwash, at least three times daily, may help eliminate bad breath. Studies show that the antiseptic and aromatic properties of Rosemary may help reduce body odor. A simple body odor remedy is to boil 10-15 stems of Rosemary in a quart of water and mix it into your bath water each day to provide a fresh body scent as well as for relaxation purposes. A simpler alternative is to add 10 drops of Rosemary essential oil to your bath water instead of using fresh stems. A study done at Sanford-burnham Medical Research Institute concluded that a key ingredient in Rosemary, carnosic acid, may significantly improve eye health. A few clinical studies also suggest that Rosemary extract may help with age-related eyesight loss and other eye conditions that affect the outer retina and cause macular degeneration. Therefore, simply drinking Rosemary tea 1-2 times daily or taking one capsule of Rosemary extract daily may help improve the health of your eyes. Antioxidants help neutralize the free radicals which damage cell membranes and lead to cell death. Studies show that the antioxidant and anti-inflammatory activity of Rosemary may help stimulate cell regeneration, which in turn reduces skin puffiness and rejuvenates the look of aging skin. For this reason, it is not surprising that Rosemary has been used in anti-aging remedies for centuries and can be found in many modern day anti-aging products. A simple home remedy for improving the look of aging skin is to drink a cup of Rosemary tea once daily. This same tea can also be cooled and applied to your hands and face with a cotton pad overnight to stimulate blood circulation and refresh and rejuvenate aging skin. Due to the healing properties of Rosemary, it has been used for centuries in the treatment of respiratory conditions such as sinusitis, laryngitis, nasal congestion, headaches caused by allergies, and colds. Drinking Rosemary tea 2-3 times daily and inhaling Rosemary essential oil vapours may help alleviate the symptoms of these respiratory conditions. To make Rosemary tea, simply strip the needles of one stem of Rosemary and put them in a cup of boiling water. Let it simmer for about 5 minutes and add honey for taste. For Rosemary aromatherapy to clear congestion, boil 5-6 stems of fresh Rosemary in a big pot of water and cover your head with a towel and inhale the steam slowly for 10-15 minutes. Rosemary essential oil can also be used in a diffuser to treat respiratory conditions. Poor blood circulation in the scalp may be a cause of hair loss. Since rosemary is known to promote blood circulation, it may help stimulate hair growth. A study suggests that mixing one drop each of rosemary, lavender, thyme, and cedarwood essential oils together and massaging the mixture into the scalp once per day for seven months may help prevent hair loss. If you have sensitive skin, this mix of essential oils can be added to one tablespoon of cold pressed almond or coconut oil before massaging. Studies show that oral and topical use of Rosemary may help treat symptoms of arthritis. Rosemary contains carnosol and carnosic acid which, according to a study, may help inhibit the inflammatory process and may help treat sore and painful muscles and joints. Drinking Rosemary tea twice daily and applying Rosemary essential oil onto sore and inflamed muscles and joints before going to bed every night has appeared to be an effective home remedy for many people suffering from arthritis. For sensitive skin, 10 -15 drops of essential oil can be diluted in a teaspoon of organic coconut or olive oil before applying. Rosemary has been used in culinary dishes for years without any reported adverse side effects. However, from a medicinal perspective, an overdose of rosemary leaves or its extract may cause vomiting, muscle spasms, and in some cases pulmonary edema or coma. Therefore, dried rosemary should not be consumed in quantities of more than 4-6 grams per day and rosemary essential oil should never be taken orally. The therapeutic use of rosemary is not recommended for pregnant women. It is also not recommended for patients who are taking medication for high blood pressure, epilepsy, or diabetes, or any type of anticoagulants, antidepressants, or diuretics since rosemary may affect the activity of these medications. It is important to consult your physician before using rosemary products in a medicinal capacity if you are taking any medication or are pregnant. Rosemary is available in many forms at grocery and herbal food stores. It can be found in fresh or dried plant form, as well as in capsules, alcohol tincture, essential oil, liquid extract, and tea forms. Fresh rosemary can be purchased at most major grocery stores. When buying fresh, make sure that the stems don't have any yellow or dark spots and are deep sage in color. When buying in dried, oil, or other forms, choose products which are made with organically grown, pesticide free and nonirradiated rosemary leaves. For a better taste and more herbal benefits, choose fresh rosemary instead of the dried variety. M. Vaquero, et al. "Inhibition of Gastric Lipase as a Mechanism for Body Weight and Plasma Lipids Reduction in Zucker Rats Fed a Rosemary Extract Rich in Carnosic Acid". In PLoS One. 2012; 7(6). H. Azad, H. Rasoolijazi, M. Joghataie, S. Soleimani. Neuroprotective Effects of Carnosic Acid in an Experimental Model of Alzheimer's Disease in Rats. Cell Journal. 2011; 13(1): 39-44. S. Cheung, J. Tai. Anti-proliferative and antioxidant properties of rosemary Rosmarinus officinalis. Oncology Reports. 2007; 17(6): 1525-31. @Olawale, taking a Zinc, Folic Acid, B12, Vitamin C, or CoQ10 supplement daily and eating foods rich in these can help improve the sperm count. Zinc rich foods include meats like beef tenderloin, lamb, oysters, and shrimp, sesame seeds, raw pumpkin seeds, and green peas. And Folic Acid rich foods include lentil beans, pinto beans, garbanzo beans, asparagus, spinach, black beans, navy beans, kidney beans and collard greens. A study suggests that men with fertility problems who took 5 mg of folic acid a day and 66 mg of zinc sulfate a day for about 6 months had a significant increase (about 74%) in total normal sperm count and a minor increase ( about 4%) in abnormal sperm count. I hope it helps! Is there any herbal remedy that increases sperm count, please. Thank you!